3 steps. Whether it's how to make a Toga or how to make a Greek Goddess costume, the steps are the same. Make this toga in minutes! No-sew option. Watch this short (under 2 minutes), fun video on how to make a toga. 1 to 3 yards of fabric, safety pins, and belt (optional). No pattern necessary. MEASURING FABRIC: Measure the length of the toga, by measuring from the shoulder to the place you want it to land. In the photos on this page, there are two examples. Both using the same fabric with a width of 55". The length for the short one is just under a yard, and the length for the floor length toga is just under 2 yards. Even this elegant looking toga is pretty casual, but because of this washable silky 100% polyester fabric, and the gold belt, it looks very elegant. Sheets, tablecloths, and a rope for a belt, or no belt are a few other options. Wrap fabric, sheet, or whatever you are using around you, just under the arms (like you would wrap a towel). About one and a half times around is usually about right, but there's lots of flexibility here. Coverage and comfort would be a couple of considerations when wrapping. Clothing underneath may be a consideration depending on how many safety pins you want to use, or how much skin you want to show. Tie just an ordinary knot, twice. Try and tie it so the right side of the fabric shows on the tie, unless you don't mind a more casual look or are using a sheet. Under the arm, where the seam of a garment would normally go is a good place to fasten it closed with a safety pin. The belt and a couple more safety pins along the length of the seam would be good. Sewing is also an option here. Just sew the seam instead of pinning it closed. Good idea to wear shorts and a strapless top under the toga if necessary. BELT: The gold belt can be purchased at most fabric stores. Before cutting the belt measure waist and add 3 or 4 inches for an overlap or tie. Use a safety pin or Velcro to fasten. Another option is to cover a belt you own with matching fabric by gluing the fabric to it. A Rope, or a ripped strip of sheet would also work. Caution: If you use Velcro, be especially careful to keep it closed when not in use, or you risk snagging any fabric it comes in contact with. 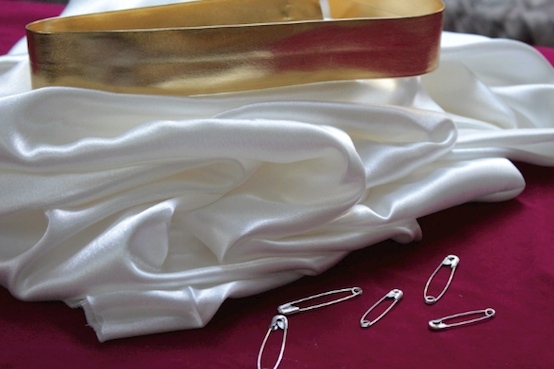 The length of this toga will determine how many safety pins you will need, but even the longest toga shouldn't require more than 3 or 4 along the side seam. Almost done with how to make a toga. 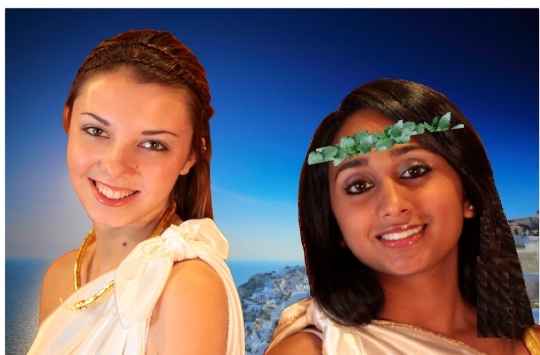 The items listed below are some of the ways to spice up this Greek Goddess-Toga costume. Sewing the seam instead of safety pins, and sewing the hems and trims, is another option with this costume. If you like the Greek Goddess look, which in this case is a bit more elegant, than it will come down to the fabric you use. This silky 100% polyester used here looks silky and elegant. If you use a plain white sheet, you'll get a more casual look. Either way, make it your own. A cape can add a royal feel, so if you'd like to dress things up a bit, make this simple little cape out of old curtains or whatever you have. The strap is just a piece of gold trim wide enough to cover a bra strap. It's pinned to the front and back of the toga. Eliminates the need for a strapless bra. Just another way of many on how to make a toga. This sash was made from some old curtains. Sheers, linens, sheets, or just about anything will work. How to make a toga.